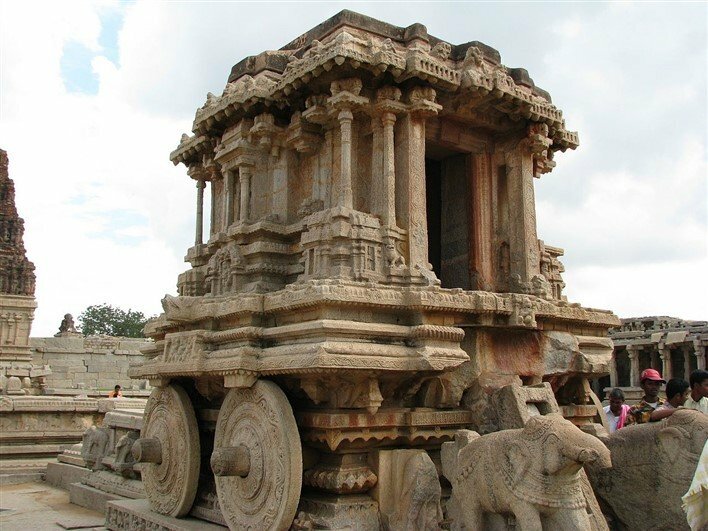 Hampi, the seat of the famed VIJAYANAGARA empire was the capital of the largest empire in post-mogul India, covering several states. Chandikesvara Temple: Lord Vishnu temple. Ganagitti Temple – a Jain temple. Hemakuta group of Temples – A cluster of ancient shrines, many of them devoted to Lord Shiva. Krishna Temple in Hampi, is a notable one with unique architecture. This temple is dedicated to Lord Balakrishna, the form of Lord Krishna when he was an infant. Kodanda Rama Temple – The Kodanda Rama temple is situated near the edge a bazaar called Virupaksha Bazaar. A path leads from the bazaar to the temple. Saraswati Temple is located in the heart of the ruined city of Vijayanagara, the capital of the Vijayanagara Empire. It is present in North Karnataka. Among the many ruined monuments there, there is a Saraswati Temple. Varaha Temple – is dedicated to Varaha Swamy, one of the ten incarnations of Lord Vishnu. Virupaksha Temple in Hampi, Karnataka is noted for its architecture and has been listed among the UNESCO World Heritage Sites. Vishnu Temple, Hospet is situated on the way to the Vitthala Temple from Kamalapura. Vittala Temple, Hampi. Karnataka is noted for its architecture. This temple is dedicated to Lord Vittala, another form of Lord Vishnu.